Scouts will light four flames atop the highest peaks of England, Wales, Scotland and Northern Ireland to spark the Paralympic torch relay. They will strike flint against steel on Scafell Pike, Snowdon, Ben Nevis and Slieve Donard on 22 August. The flames will visit UK capital cities before uniting in the home of the Paralympic movement, Stoke Mandeville. A 24-hour relay will then take in Tower Bridge, London Zoo and Lord's en route to the Games' opening on 29 August. There, the cauldron will be lit to herald the start of the Games. London 2012 organisers Locog have released the full street-by-street route of the relay which starts at 20:00 BST on 28 August and travels overnight to London. It will see the Paralympic flame carried 92 miles by 580 torchbearers, working in teams of five, from Stoke Mandeville Stadium through Buckinghamshire, Hertfordshire and all six of London's host boroughs to the Olympic Stadium in Stratford. The 24-hour relay would be be a celebration of the courage, determination, inspiration and equality that every Paralympian represents, said London 2012 Chairman Sebastian Coe. "By creating the four flames through human endeavour at the four highest peaks in the UK we will ensure that the spirit of each home nation is represented in the Paralympic Flame," said Lord Coe. He urged spectators support the Paralympic torch relay by taking lanterns to a flame festival, supporting a torchbearer or lining the route of the 24-hour relay. After the spectacular success of the Olympic Games, London was now gearing up for a Paralympic Games that was already on track to be a sellout for the first time ever, said Mayor of London Boris Johnson. "The Paralympic torch relay is the perfect moment to get your flags back out and get behind the incredible athletes taking part as the excitement builds once again right across the capital," said Mr Johnson. Most of the 580 Paralympic torchbearers were chosen by the British Paralympic Association or through public nomination campaigns run by BT, Lloyds TSB and Sainsbury's. Flame festivals will be held in London on 24 August, and then on consecutive days in Belfast, Edinburgh and Cardiff before the four flames come together in Stoke Mandeville to create the Paralympic flame. London's event will see a ceremonial cauldron lit in Trafalgar Square, Belfast's festival will have a lantern procession outside City Hall and a cauldron-lighting outside Stormont. Scotland's flame will light a ceremonial cauldron on the Mound in Edinburgh and a lantern procession at Meadowbank Sports Centre, while Cardiff's ceremony will include a cauldron-lighting outside City Hall and a lantern procession in Roald Dahl Place. In addition, some 38 communities around the UK will stage flame celebrations during the August Bank Holiday weekend, with communities sending a representative to collect part of the flame from their national capital to be the centre-piece of local festivities. After the flames unite at Stoke Mandeville on Tuesday 28 August, the 24 hour relay begins. 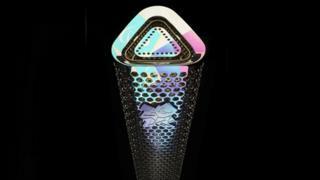 It was created by London-based designers Edward Barber and Jay Osgerby, who were also behind the Olympic torch. They said it was driven by a desire to reflect modernity and innovation. It is made from an aluminium alloy - light while being strong and heat-resistant. The holes also make the torch lighter and give it a texture that is easy to grip.